Shake It With Pride This item is on sale. Shaker Valley Harvest This item is on sale. FROM STORE OVERSTOCK, NEVER USED...From Blue Ribbon Designs, a Shaker carrier and needlework smalls. This autumn project features a design for the base of an oval Shaker shallow carrier (also suitable for framing)...along with a handle wrap, an owl-shaped pincushion, a needlebook with leaf-shaped pages, and a floral scissor fob. Chartpack includes charting and complete finishing instructions for the carrier base, handle wrap, needlebook, owl pincushion, and floral scissor fob - along with stitch diagrams, stitching instructions, wool felt/fabric templates, and an alphabet/numbers for personalization. Shape of Things, The - Country Ovals This item is on sale. From Graph It Arts, out of print chart is in EXCELLENT condition, appears never used, with no markings of any kind and minimal writing on front cover. Shape-y Wreaths This item is on sale. FROM STORE OVERSTOCK, NEVER USED...From Marilynn & Jackie's Collection, 13 fun shape-y wreath designs for all seasons and months. Shared Joy This item is on sale. FROM STORE OVERSTOCK, NEVER USED...From Designs By Lisa, cute cute cute and stitched on 32ct Beach Walk linen using Gentle Art Simply Wool threads (or DMC floss) with a stitch count of 56 x 56. Sheep Farm Pin Pillow, A This item is on sale. FROM STORE OVERSTOCK, NEVER USED... From Thistles, shown on 32ct linen with a stitch count of 100 x 100. Uses Gentle Art Sampler Threads or DMC floss. Sheep In A Garden This item is on sale. Sheep in the Meadow Tabletopper This item is on sale. SHOP OVERSTOCK .. From Dutch Treat Designs comes another one of their wonderful tabletoppers! "For all the sheep folk, and for those who shepherd their flock. Psalms 23!" And partially dedicated to our own Queen Deb! Stitched on 18 count Teal Green Anne Cloth using Caron Watercolours and DMC Perle Cotton. Sheep In The Middle This item is on sale. From Joy of the Needle, out of print chart is in EXCELLENT condition, appears never used, with no markings of any kind. Shoo Fly This item is on sale. From Jeanette Crews Designs, appears never used, with no markings of any kind and minimal writing on front cover. Sign Of Halloween This item is on sale. FROM STORE OVERSTOCK, NEVER USED...From Stoney Creek, black cats, jack o'lanterns, trick or treatgreetings and things that glow in the dark are all a Sign of Halloween. Turn off the lights and watch the jack o'lanterns, cat's eyes, nose, and whiskers, and the words glow in the dark. Uses DMC floss, Kreinik Glow In The Dark Blending Filaments and has a stitch count of 84w x 83h. Stitched on 28ct White Jobelan. Sign of Welcome This item is on sale. 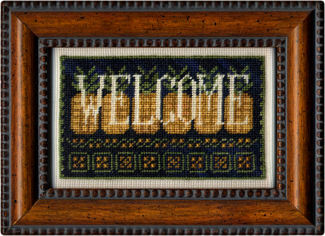 FROM STORE OVERSTOCK, NEVER USED...From Erica Michaels and her Petites Collection, a classic rendition of the traditional pineapple welcome motif. Uses Gentle Art Sampler Thread (Baby Spinach, Black Crow, Bfrandy, Oatmeal & Toffee) with a sitthc count of 87 x 54. The chart pack contains the 40ct Silk Gauze, full page charts with clear stitching instructions and tips. It's easy - you CAN do this! Signs Of Love This item is on sale. FROM STORE OVERSTOCK, NEVER USED...From Poppy Kreations - two designs in one! "I Love You More" is shown stitched on 28ct Baby Lotion Cashel using Weeks Dye Works and Crescent Colours floss. "You are the Frosting on my Cupcake" was stitched on 28ct Antique White Jobelan with Organza Pink, Sunkissed, & Cerise from Crescent Colours. Signs of Spring This item is on sale. FROM STORE OVERSTOCK, NEVER USED...From Erica Michaels, chart is in EXCELLENT condition, with no markings of any kind and price sticker on front cover. Simple Celebration This item is on sale. FROM STORE OVERSTOCK...From Dutch Treat Designs, this chart pack comes WITH the Antique White Anne Cloth 18ct 9-square fabric, chart, needles, thread pallete, and #12 Perle Cotton. You provide the #5 DMC Perle Cottons (310, 311, 3041 and 2 skeins of 501). Simple Garden Fare This item is on sale. FROM STORE OVERSTOCK, NEVER USED...From Full Circle Designs, out of print chart is in EXCELLENT condition, never used, with no markings of any kind and price sticker on protective plastic cover. Simple Gifts This item is on sale. From Lavender & Lace, chart is in GOOD condition, with no markings of any kind. Simple Gifts - Hearts (with Emb Pack) This item is on sale. FROM STORE OVERSTOCK, NEVER USED...From Praiseworthy Stitches, stitched on a 16 x 20 cut of 32ct Irish Cream linen using DMC or Sullivan's floss. Features a needle roll, thimble purse, pyncushion and scissor fob. The chart comes with all the embellishments used. Simple Life, The This item is on sale. FROM STORE OVERSTOCK, NEVER USED...From Elizabeth's Designs, chart is in EXCELLENT condition, appears never used, with no markings of any kind and price sticker on front cover. From Leisure Arts, Leaflet 461, published 1986. Out of print chart is in VERY GOOD condition, appears only slightly used, with no markings of any kind. Includes seven designs. Simple Little Big Love This item is on sale. FROM STORE OVERSTOCK, NEVER USED...From Alessandra Adelaide, two lovebirds sitting in a tree. Their tail feathers form the top of a heart. Around the base of the tree are several mini hearts. Stitched on fabric of your choice using DMC floss. Stitch count 205w x 206h. Simple Pleasures - Autumn Teenies I This item is on sale. FROM STORE OVERSTOCK, NEVER USED, IN EXCELLENT CONDITION...From Homespun Elegance - what fun!! These three little designs are stitched up on 32ct Amber linen using Weeks Dye Works and/or DMC floss with a stitch count of only 20 x 26 (for the largest)! The chart pack comes with the autumnal colored PIPE CLEANER trim for making into tiny ornaments or pins! Simple Pleasures - Autumn Teenies II This item is on sale. Simple Sampler This item is on sale. FROM STORE OVERSTOCK, NEVER USED...From By The Bay Needleart, stitched on 14 count Forest Mist Aida using DMC floss. Stitch count is 98 x 126. Simply Country This item is on sale.